Wendy Wahl’s work has been called textiles, art, design, sculpture, and installation; all of these are appropriate. Her commercial design career began in 1985 with a line of hand-printed textiles for interiors. Working collaboratively with V’soske, she has designed one-of-a-kind, site-specific carpets for private clients. She has also created two- and three-dimensional objects, some occupying an entire room. Each body of work uses pliable materials, including cloth, thread, yarn, paper, and wax, as expressive elements. “Wahl uses materials often labeled for craft and pushes them into a contemporary extreme somewhere between art and object.” Anna Hammond, ARTnews. Wahl’s studio work has included a series created from pages of discarded Encyclopedia Britannica, World Book, Funk and Wagnall’s and various dictionaries. “These materials . . .have unique physical qualities, carry immense meanings, and need to be remembered,” she said. 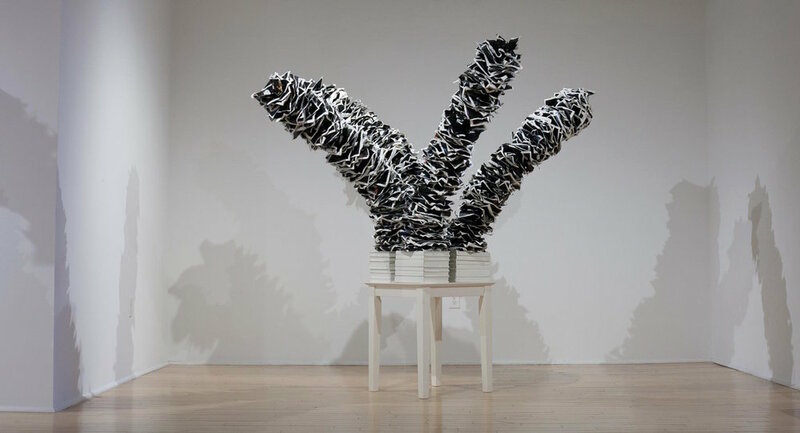 Wahl’s work has been exhibited internationally and is in collections including those at the Cooper-Hewitt Museum and the Museum of Art, Rhode Island School of Design; it has been the subject of exhibitions at the Grand Rapids Art Museum, MI, the Newport Art Museum, RI, and Fuller Craft Museum, Brockton, MA. She was selected for Networks, a project documenting Rhode Island artists through video and exhibition, and she has received artist fellowships from the Rhode Island State Council on the Arts. Through the Art in Embassy Program, her work was selected for the US Ambassador’s residence in Tashkent Uzbekistan. Art News, Casa Vogue, Metropolis, New York Times, Architectural Digest, The New Yorker, the Curated Object, the Wall Street Journal and other publications have featured her work. Kim Svoboda will share highlights from her recent fiber arts tour of Japan – the artists, the food, the museums, the shopping, and more. While there, – she participated in a variety of textile workshops – including natural dyeing, felting, fabric manipulation, and weaving —and although she did not create any masterpieces, she learned a lot. A cultural show & tell.